Is your team using video collaboration & conferencing applications such as Microsoft Lync, Skype and Skype for Business, Google Hangouts, Cisco Jabber, or the Lifesize Cloud? Just add the Lifesize Icon Flex video conference system and you can bring it to life. The Lifesize Icon Flex is a business-class video and audio conferencing system that brings the benefits of high quality video conferencing, the Lifesize touchscreen Phone and award-winning support to your collaboration application. Ideally suited for the small meeting room or desktop, the Lifesize Icon Flex is easy to set up and use. Business class meetings require business-class video. The consumer accessories you use alongside your video conferencing application is okay when you’re using it at home to conduct a point to point video call, but it will not deliver the high quality video and audio you require when video calling in a meeting room with multiple participants, or if you are taking part in a professional or important discussion. The Lifesize Icon Flex video conference system with its powerful PTZ camera, comfortably sees everyone in the room and delivers the highest quality video output, ensuring that your meeting is displayed in crystal clear High Definition. Plays well with multiple applications. The Lifesize Icon Flex is designed to seamlessly work with Microsoft Lync, Google Hangouts, Cisco Jabber, Skype & Skype for business, and the Lifesize Cloud, or any other video collaboration solution at the desktop, which means that you and your client across the world, who’s using that “other application,” can now both use the Lifesize Icon Flex to conduct the highest quality professional video calls in the meeting room. Simple installation. No tools required. Installation of the Lifesize Icon Flex is simple. Simply put it in a central location in your meeting space, connect it to a power source and a laptop and let everyone know it’s ready for using alongside their favourite video conferencing applications. Perfect for your Cloud Solution. 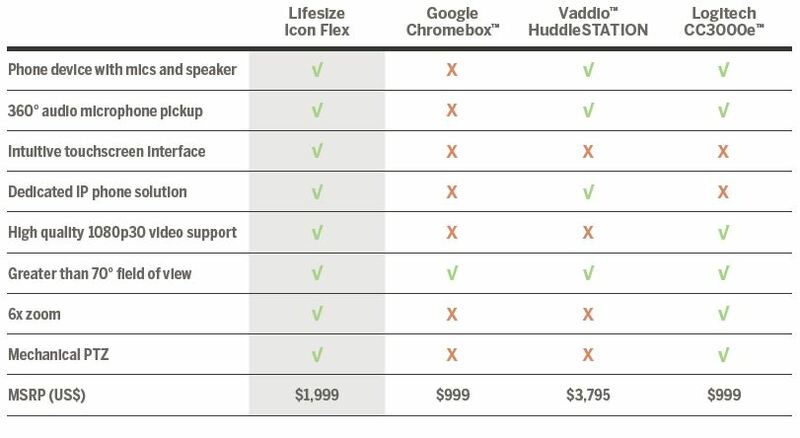 VideoCentric recommends the Lifesize Icon Flex as a perfect addition to a whole host of cloud video conferencing services, including the Lifesize Cloud, the Cisco CMR’s or the VideoCloud 365. Talk to us today about Cloud bundles we can provide including the Lifesize Icon Flex and a subscription cloud based service for your organisation. As one of only 2 video collaboration integrator’s in the UK to have been awarded level of Lifesize Gold Partner, VideoCentric hold the highest possible accreditation level available with Lifesize, and is uniquely positioned to deploy, operate and support Lifesize Video Conferencing equipment & solutions. VideoCentric are recognised for our continued training, customer care & information programmes, and technical product development with the Lifesize team directly. Both our Sales and Technical teams are trained at Gold Expert level, and our extensive experience and knowledge of LifeSize Endpoints and Infrastructure enables us to provide the highest levels of support for a single video system through to some of the most intricate and unusual video infrastructure set ups & integrations. VideoCentric have a dedicated Lifesize Cloud manager and can demonstrate every Lifesize endpoint, infrastructure & solution from their extensive demonstration & interoperability testing lab– the most comprehensive suite of it’s kind in Europe. As a Lifesize Gold Partner, VideoCentric are perfectly positioned to assist you with all your Lifesize Video Conferencing and Networking needs. See our Video Conferencing hire equipment page to see the Lifesize systems available to hire for your event. Contact us today to speak to us about our Lifesize solutions.